HI and welcome to DIYprojectionTV. So what will this site show you how to do??? You'll just have to trust me for now, but you will soon see that that thing will convert your boring 14inch tv into a 5 foot by 7 foot projection TV! So just click here to get started! Want to know how much this will cost to make. 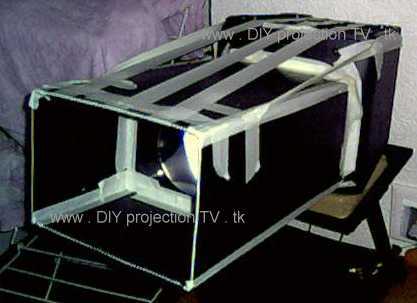 . . look here and youll see how much i made my 7 foot by 5 foot projection unit for! What else is new on the site? Well ive now added more pages, to try and make the building process easier. Also a new FAQ, sorry these no links in it or photos yet, will be after the weekend! Cheers for visiting, i hope you enjoy the site! SO FAR unique users have visited this site since Febuary 20th 2002!